Serenity Now: Easy, Kid-Friendly Treat for the 4th! Kate, one of my most favoritest bloggers ev-er, is hosting a Stars and Stripes Party today and I just had to join in! We're getting into the patriotic spirit around here, and I let the girls help me in the kitchen yesterday. I told them we were going to make Chocolate Dipped Pretzels as a surprise for Daddy, and they were stoked. Natalie did sort of break the rules and told T "not to look at the pretzels on the counter because it's a surprise," but they kept the overall secret pretty well. Chocolate Dipped Pretzels are the perfect blend of sweet and salty! I melted milk chocolate and white chocolate in separate glasses. Juice glasses work well because they are short and skinny. Then I let the girls dip until their hearts were content...or until I couldn't take the chocolate splatters anymore. 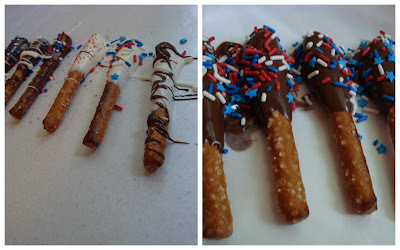 Before the chocolate hardened on wax paper sheets, we topped the pretzel treats with sprinkles and swirls of chocolate. Stacked on a Stars and Stripes platter from The Dollar Tree, they made for a delicious treat! Shockingly, T didn't put the sight bags of chocolate chips and the pretzels on the counter together, and he was surprised when he got home from work last night. Do you have a favorite dish to share around Independence Day? 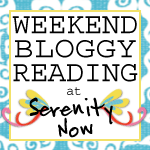 Check in for Friday's Weekend Bloggy Reading for some great recipe links! If you stop by tomorrow, I'll have a post up with some fun summer activity ideas. If I remember to, I'll include a linky so you can join in if you have a similar post to share. I am officially counting down until my Eclipse movie night tonight at 7 with my friend L. We're looking forward to drooling over Jacob and Edward. And don't forget the popcorn! I plan on making these this weekend!! Yummo! I'm going down to Leesburg, VA on Thursday to the new house of my BFF since 7th grade. 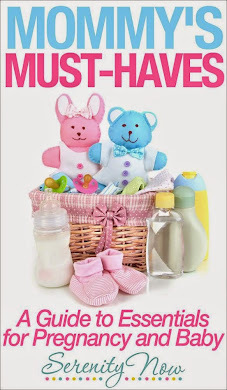 We're going to arrange furniture and come up with a decorateing plan, then put all of our kids to bed and let BFF's hubby and mom babysit while we go to see Edward! Can't wait! It's so festive! Looks like the girls had a great time! I love chocolate covered pretzels. Well, I love anything chocolate covered. lol. But seriously, what a great way to get in the kitchen with the kids right? Have fun tonight at the movies. I'm waiting until all the madness and I'll be able to hear the movie over swooning teens. lol. Oh, I love this, what a simple, yet festive idea ! Glad your girls could help - have so much fun drooling over Edward tonight, yay ! They look so impressive too! My kids would like this. The pretzels look terrific!! I am glad he was surprised!! That is so cool! Cute and easy! Will have to use this for my 4th of July party! Thanks for commenting on my blog! Those pretzels look absolutely delicious! I love, love, love chocolate-covered pretzels. And adding the sprinkles is a great touch! Question: do you just melt the chocolate chips and start dipping? Or do you add some paraffin? I always forget about chocolate covered pretzles! 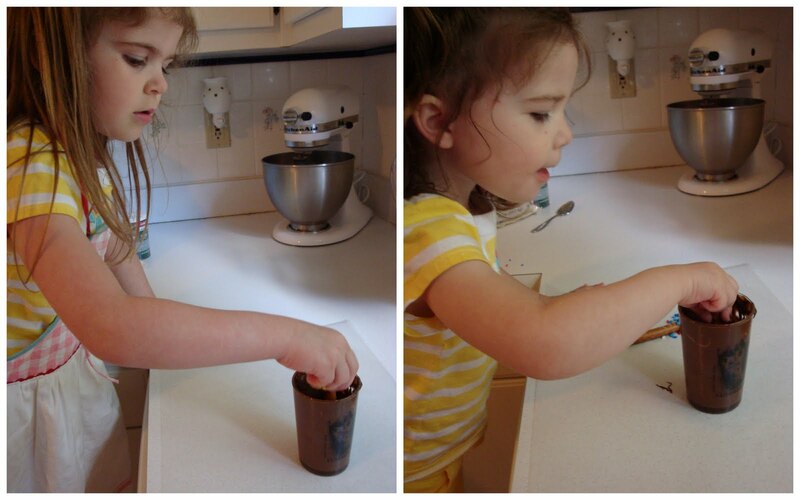 They are delicious and they look so easy that I could put my three year old to work. Great post! Looks like a million bucks girlfriend! ooohh.........marshmallows!! Those are super cute and pretzels and chocolate are YUMMY! Have fun at the movie! TEAM JACOB! I seriously love these! They are so simple to make and fun! Those look so good! I really need to get on the ball for the Fourth. I have done NOTHING this year. Sad. 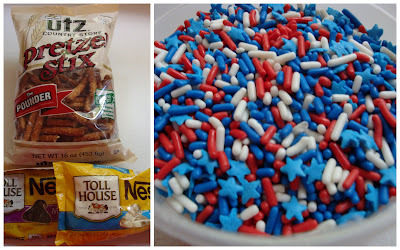 Those pretzel treats look mighty tasty and very festive for the 4th. Sweet and salty is a perfect combination! Let us know what you thought of Eclipse. Being the cheapskate that I am, I'll wait until it comes to the dollar theater to see it. We drove past the movie theater last night and it was packed! I hope you had a fun girls night out! Oh Yum! So patriotic and delicious! your girls did a much better job than i've ever done dipping pretzels. my technique is a tad lacking. they look delicious & soooo festive! OH what a FUN idea!! So perfect to bring to a party too -- cheap and easy. I love this Amanda!! Those look so delicious! I will have to make some for my H this week. How fun!! I am making these tonight with my boys! Thanks for the idea.